First Floor 2536 sq. ft.
Width 68 ft. 4 in. Depth 83 ft. 10 in. Approx. Height 23 ft. 10 in. This Mediterranean house plan features everything you will want in an efficient design. Stylish Sunbelt details and a stucco façade are sure to catch your eye. 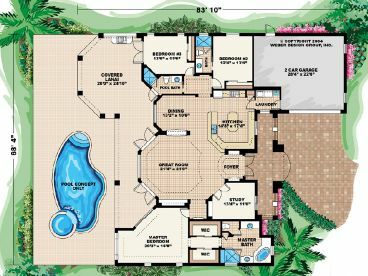 With less than 2600 square feet of living area, this home plan still offers three bedrooms, three full baths and an open floor plan. You will love the convenient location of the island kitchen, complete with snack bar, as it easily accesses the bayed dining room, laundry room and two-car garage with storage. The great room is a comfortable and spacious gathering area with two double doors leading out to the covered lanai. 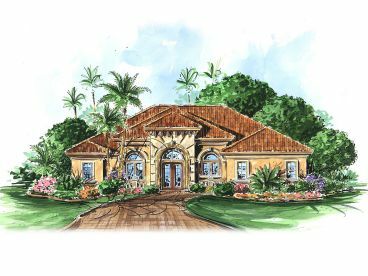 The lanai can be accessed from the master bedroom room and Bedroom 3 as well, and features an optional outdoor kitchen, perfect for grilling and casual entertaining. Don’t miss the pool bath providing functionality and extra convenience. French doors and built-ins punctuate the peaceful study, perfect for a home office. Split bedrooms lend privacy to the master bedroom showcasing His and Her walk-in closets and a deluxe bath. Another full bath is snuggled between the children’s bedrooms. 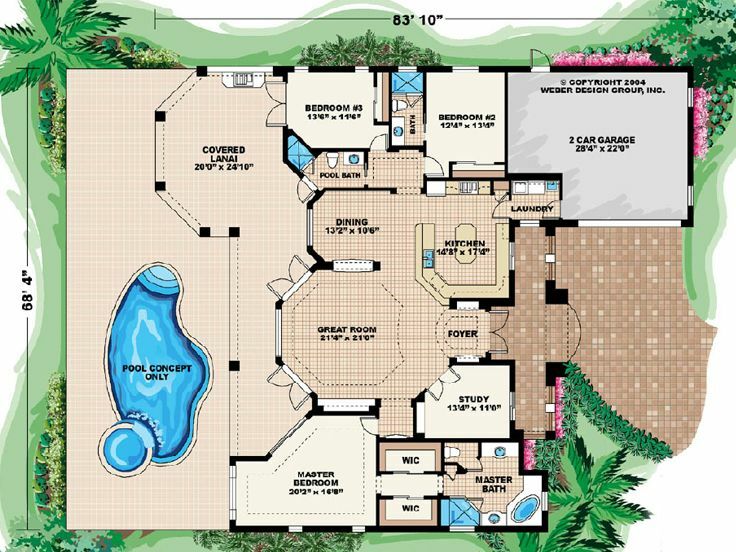 Comfortable features and stylish elements set this ranch home plan apart from other Sunbelt designs.